A private members' club in central London has lost a bid to use tips and service charges to "top up" staff pay. Annabel's in Mayfair said its restaurant staff earned above the minimum wage under the scheme. But HM Revenue and Customs told the Court of Appeal that it lost out on VAT and National Insurance contributions. 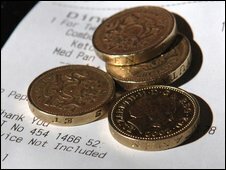 From October all employers will be banned from using tips and service charges to "top up" staff pay to meet the minimum wage. The club said the pay scheme it operated in its restaurant benefited customers, staff and employers. But HM Revenue and Customs (HMRC), which enforces the minimum wage, said the club did not pay VAT and National Insurance contributions under the scheme. This was because money Annabel's paid to staff under the scheme was not paid directly as wages. On Thursday the Court of Appeal upheld a January employment appeal tribunal ruling in favour of HMRC. Lord Justice Rimer said: "The employer cannot claim that (Annabel's) paid the relevant money to the employee because it was not its money that was so paid." He added: "Many will see no injustice in this. They would wonder why employers should be entitled to use discretionary tips - probably intended by most customers to go direct to the staff - to satisfy their obligations to pay such staff the national minimum wage." The ruling came one day after Employment Relations Minister Pat McFadden said the practice of allowing firms to use service charges to pay staff would be banned.